The Bongo still rules in our view and will do for some time, but the Nissan Elgrand and Toyota Alphard are making inroads. 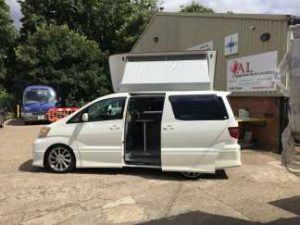 Please call us or email and will send you the largest UK stock of high level Mazda Bongo, Toyota Alphards, Nissan Elgrands, and the real low down on each; we have enormous stocks of all, so no bias. In a nut shell the Bongo with a larger roof , still dominates the 12-15k market, after 15k the Nissan and Toyota fight it out.